Posted January 27, 2019 by Josette Farrell in News. 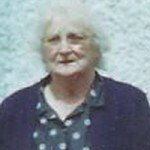 Annie Healy (nee Walsh) Liscaninane, Claregalway, Co. Galway. Peacefully in her ninetieth year, surrounded by her family. Predeceased by her husband Pa. 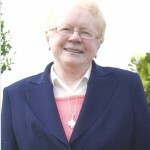 Sadly missed by her loving family daughters Bernie (Connolly), Ann (Cunningham), Carmel (Cullinane), Rita (Creaven), Nonie (Naughton), sons Michael, John and Martin, daughters-in-law Bernie, Catherine and Mandy, sons-in-law Gerry, Martin, Jarlath, Patrick and Martin, grandchildren, great-grandchildren, sister Mary (Lydon), brothers Myles and Peter, sister-in-law Phil, nephews, nieces, relatives, neighbours and friends. Reposing on this Sunday from 4.00 at Our Lady’s Chapel, Lackagh, with Removal to the Church of Lady of Knock, Lackagh at 7.00pm. Funeral Mass on Monday at 12 noon with burial afterwards in Cregg Cemetery. Family flowers only Donations to Galway Hospice.